My grandmother had a pantry in her house and in it were all sorts of home made treats. I can remember her old fashioned preserving jars – especially the large one, full of pickled onions. I liked nothing more than taking one out of the jar and eating it, one ‘leaf’ at a time. This has to be an inherited trait as my father would do the same as a child, often with pickled onions, and sometimes just with the raw onions sitting in the bag in that very same pantry. I used to eat raw onions until I met Dave. He totally objects to them in any shape and form. To him, onions must be soft and totally cooked down to nothing before anything else is added to the pan. After 20 years of being together, my palate has changed and I cannot eat raw onions any more. I find the smell quite pungent, and they basically ruin your palate for anything else. So, a few months back I was quite surprised when Dave mentioned he actually liked pickled onions. I have never made them since we started living together and decided I would make a batch for us to enjoy at home. I sent my mother a message asking her for my grandmother’s recipe and it really is so simple. I used white vinegar for mine as that is what I had at home that needed using up. 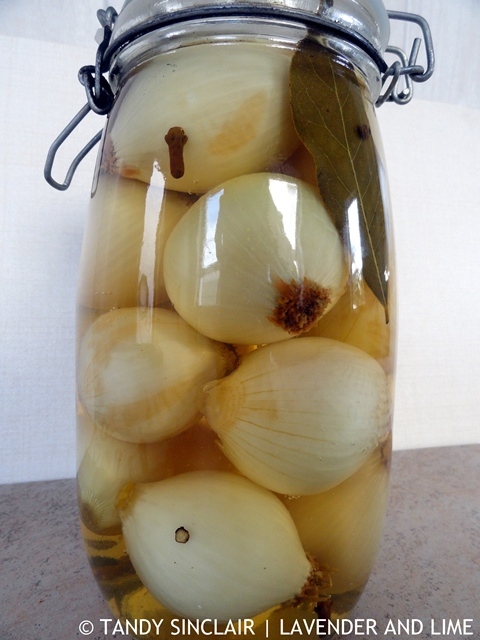 I think they will be much better made with malt vinegar and as soon as Dave and I have worked our way through these very large pickled onions I will make more. It may sounds strange but I love onions! They’re one of my favourite vegetables but they make me cry so much. So as much as I love eating them, I have to be cautious when cutting them up. Hubby is even worse, he has to go outside when I slice up onions! Pickled onions sounds delicious and healthy. They were the smallest I could find! Always have pickled onions in the pantry – such a useful addition to any platter. 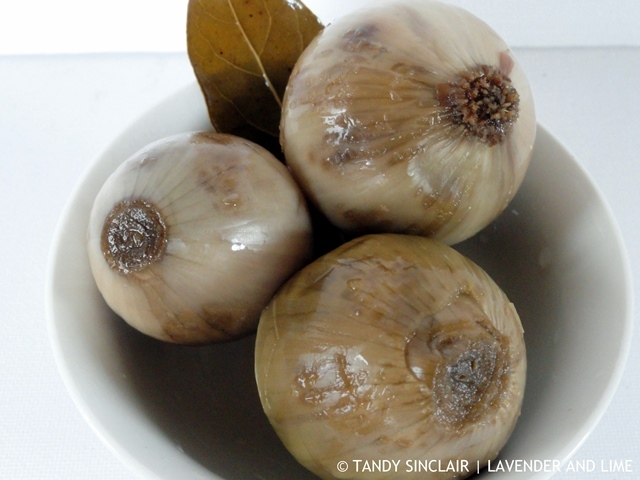 Have a mixed approach to raw onions – will often give them a soak in acid to mellow the flavour.. I love your idea of pickling onions! I don’t eat raw onions, but I do love onions. And they are so healthy!! I love recipes that have family ties and remember you of family. Lovely. Pickled pickles like yours are so much better than raw onions, especially in salads and salad dressings. Simple and easy recipe. Great post Tandy. Anthony also can’t abide raw onions (and they don’t love him) so I no don’t eat them either. Like you, I no longer have much of a tolerance for them. I do love a pickled onion though and even better on a Ploughman’s lunch.